Guided by Mark Richards, the consummate fell-walker, this film concisely defines an original week's walking holiday in two parts. The opening sequence is a three-day journey, drawing you from the eastern edge of the National Park through ten spellbindingly beautiful Lakeland valleys, destination - the fabulous mountain sanctuary at the head of Great Langdale. 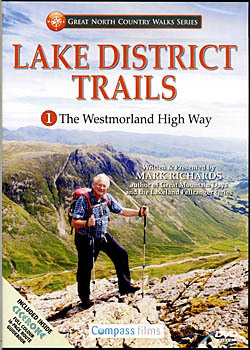 There, at the ultimate 'high divide' and westernmost limit of old Westmorland, amid such enigmatic heights as Pike o'Blisco, Crinkle Crags, Bowfell and the much-loved Langdale Pikes, Mark embarks upon the thrilling second phase of his High Way adventure, climbing the dizzy heights, there's romance and drama in every step. An invigoration to walk, an inspiration to watch.